Whether it’s a surprise milestone birthday, a large gala dinner or a royal visit, events can be crazy or cool depending on the amount of planning put in place. With the announcement of Oprah’s return to Australia in December, we have been thinking about everything that goes into planning an event for the ‘lady of talk’. 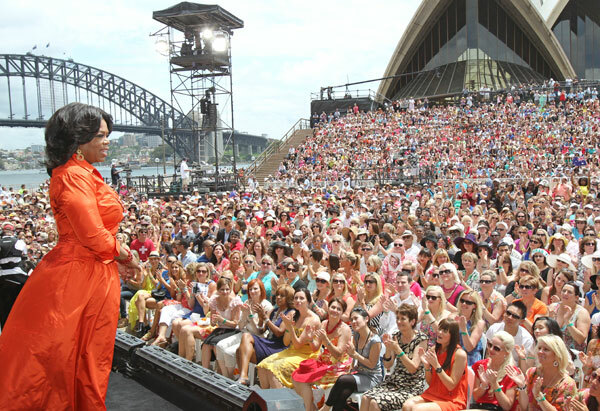 From dawn until dusk, Oprah’s events during her 2010 visit went off like a rocket and appeared to her audience: flawless. Each provided a carefully staged managed glimpse at the country we call home. From the audio visual spectacular of the lighting of the Big O on the Sydney Harbour Bridge during her official welcome event to an intimate dinner in the Block Arcade in Melbourne, no detail was left unplanned. There are things that can be controlled, like the venue, the food, the people you invite (not who turns up). But, there are also the uncontrollable elements of events from timing to weather to guest behaviour (tsk tsk). Here were 5 event highlights from her time in 2010. We wonder what will be in store for December. Mistakes at events are hard to hide. And one error generally leads to another. Timing, food requirements can all lead to disaster. So it doesn’t hurt to double and triple check.